On Friday afternoon, May 14, 1948, a few hours before the termination of the British Mandate, David Ben-Gurion proclaimed the establishment of the “State of Israel.” He declared the establishment of a Jewish state in Eretz-Israel, to be known as the State of Israel, which would come into effect on termination of the British Mandate at midnight that day. 37 members of the Council of the People had arrived to a “secret” meeting, only to discover half of the population of Tel-Aviv standing outside the museum. The members of the Council were unable to agree to a formulation of the Declaration, but as the Sabbath was approaching, David Ben-Gurion read from a draft and the signing was done on empty parchment. When Ben-Gurion finished reading, the audience stood. Rabbi Yehudah Leib Fishman blessed the Shehechiyanu and HaTikva was sung. 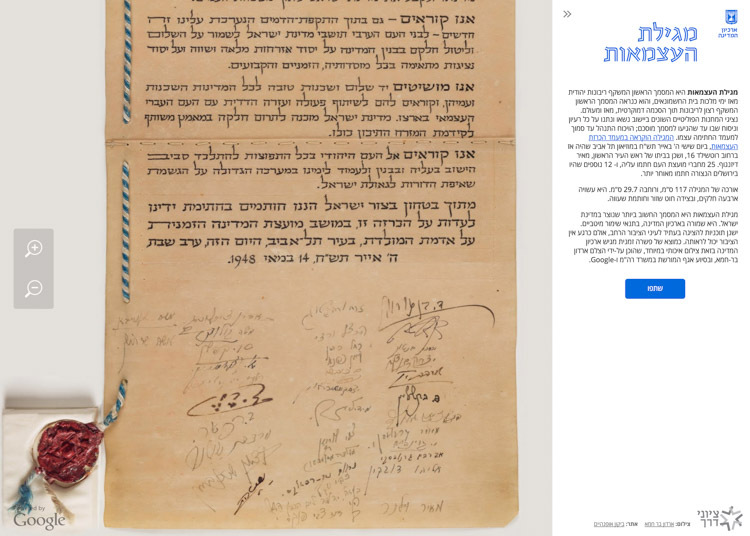 Presently, the Declaration of Independence of the State of Israel is not on display to the public, but a digital version can be viewed online in ultra-high resolution. As a result of a partnership between Google and the Prime Minister of Israel, Ardon Bar-Hama descended into the vault of the Israel State Archives to photograph the scroll so that the ink, thread and text can be seen clearly in digital format.